Brennan Bodyworks is now an Audi Ultra Collision Repair center, meeting and exceeding Audi's strictest standards of workmanship, equipment, training and service, That certification to repair Audi's advanced S8, R8 and TT models is your assurance that our shop is the right choice for your Audi. If your Audi endures collision damage, you deserve the confidence and peace of mind that comes from knowing the auto body shop handling your repairs is an elite Audi collision facility. 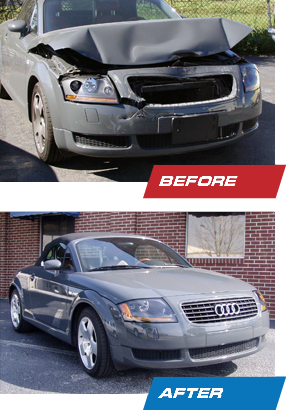 As an Audi Ultra shop, no other auto body repair shop in Central Florida knows your Audi better than Brennan Bodyworks. While you can take your car to any auto body repair shops, repairs that are not performed using procedures approved by Audi may not result in restoring your car to the manufacturer’s specifications. And the car may not provide the same original safety margin if there is a subsequent collision. Whether the problem is parking lot rash or major collision damage, you deserve the skilled auto body repair services you will get at Brennan Bodyworks Audi Ultra Authorized Collision Repair Facility. For your Audi, why take a chance on anything else?